Miles Scott, 5, who was diagnosed with leukemia when he was 18 months old, becomes a ‘full-blown phenomenon’ as a celebrity crime stopper. SAN FRANCISCO — Crooks beware! 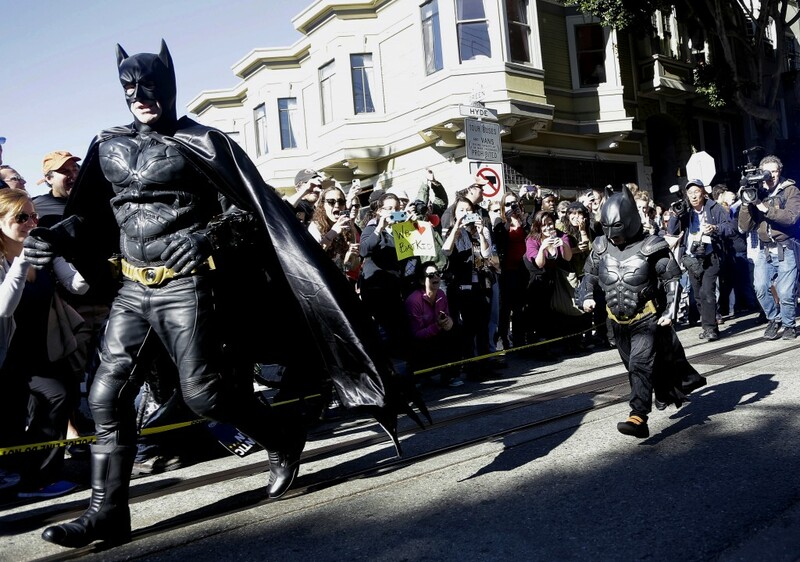 Batkid is fighting crime Friday on the mean streets of San Francisco. 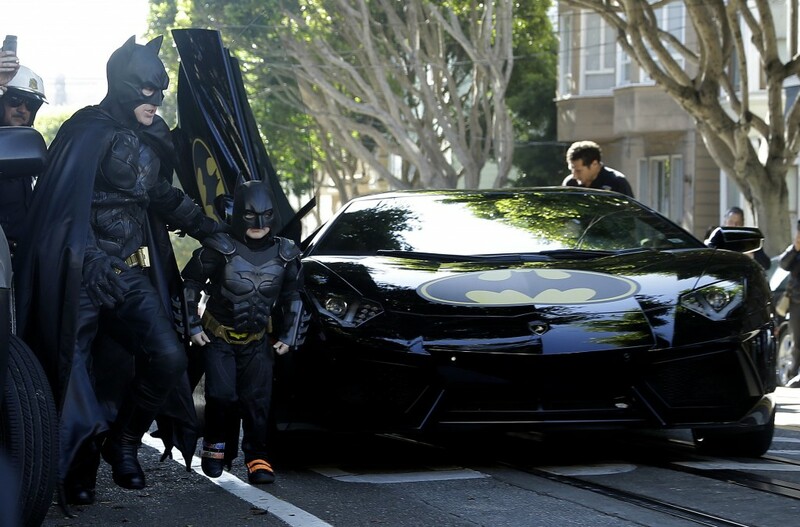 With the help of the Make-A-Wish Foundation and the city, 5-year-old Miles Scott, aka Batkid, took off from Union Square in the morning in one of two Batmobiles — black Lamborghinis with Batman decals. Police escorted the Lamborghinis and closed off roads as they sped to their first caper: a damsel in distress on a cable car track. Hundreds of people jostled for space, as the boy, a leukemia patient who’s in remission, dressed in a Batman costume and accompanied by an adult Batman impersonator emerged from the Lamborghini to rescue a woman. Miles looked overwhelmed and was bashful. The damsel sat on the street in a green dress and thigh-high black boots. She had a handkerchief around her mouth and her hands were bound behind her back. Batman and Batkid jumped on a trampoline, as the crowd roared. They rescued the woman and disabled a plastic replica bomb she was tied to. The two masked superheroes then took off to nab the Riddler as he robbed a downtown bank. A flash mob will summon Batkid later in the day for another crime — the diabolical kidnapping of the San Francisco Giants mascot — Lou Seal — by the Penguin. A grateful Mayor Ed Lee will give Miles a key to the city after the crooks are corralled. Miles didn’t know what was in store for him and thought he was in San Francisco just to get a Batman costume so he could dress like his favorite superhero, KGO-TV reported. Miles, who lives in Tulelake in far Northern California, was diagnosed with leukemia when he was 18 months old, ended treatments in June and is in remission. His father, Nick Scott, thanked the Greater Bay Area Make-A-Wish Foundation and the estimated 7,000 people who will help make his son’s wish come true. “All the doctors, nurses and all the other parents that have to deal with the same thing we’re going through. I hope they get a conclusion to their illnesses like we’re getting,” Nick Scott told KGO-TV. Make-A-Wish has fulfilled similar wishes across the country. In Anaheim, a child became Batman’s sidekick, Robin; and in Seattle a child was a secret agent, said Jen Wilson, a spokeswoman for the local organization. The San Francisco Chronicle, KGO-TV and thousands of volunteers were participating in the event. Miles was supposed to see a broadcast in the morning with Police Chief Greg Suhr calling for his help. 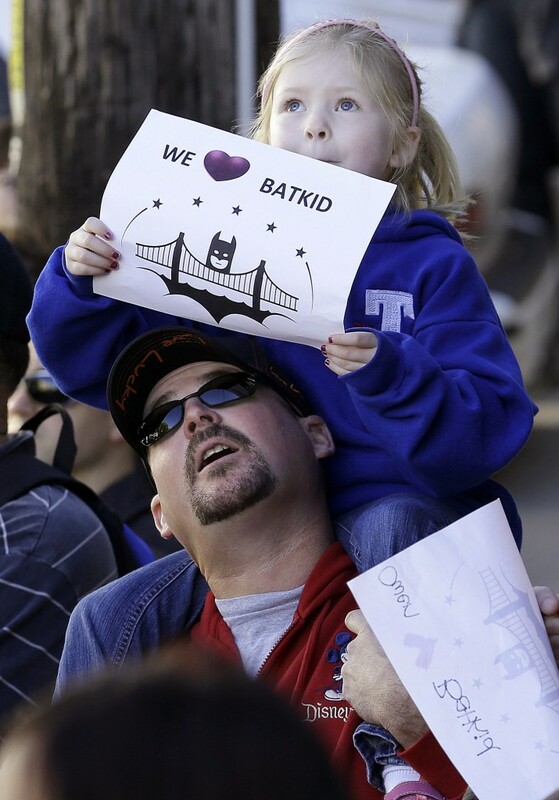 The Chronicle planned to distribute special-edition newspapers with the headline, “Batkid Saves City,” in Union Square, where the flash mob was set to gather. “This has turned into a full blown phenomenon,” Suhr said Thursday.